Chase being presented in Best of Breed Black Mountain Kennel Club Oct 2013. Notes: Chase was a fast finishing Champion with 3 Specialty Majors and 4 total majors between the age of 9 and 11 months. 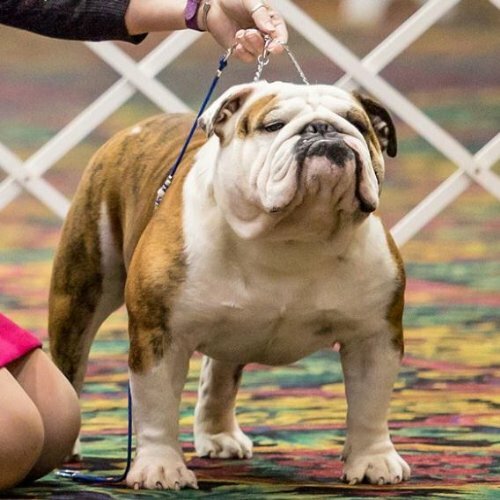 He finished his Grand Championship in style 6 months later by going Select Dog at the PCBC Back up Specialty to the National under esteemed judge Mrs. Jean Hetherington. Chase is a sweet, sound dog who is producing lovely puppies with good conformation. Chase has many group placements and taken a Group 1 (over 225 non-sporting dogs) with Mr. Edd Bivin at the Fiesta Cluster 2013. 2014 has already brought him a Best in Specialty show and several group placements as well. Chase is Platinum Health Ambassador Eligible with Heart, Patellas, Thyroid, Elbows, Trachea and is HUU N/N. He is not just a pretty face, he is a healthy example of our breed. Chase showing to Jean Hetherington Nov 22, 2012 before being awarded Select Dog.